IP65 water proof and dust proof rating means complete protection against contact with dust or water projected by a nozzle against the device from any direction. Rugged protective body means it is ultra-durable against damage, resistant to drops and shakes. See in the dark with this multi-purpose power bank. 2200mAh battery size that will charge most phones fully on one charge. This portable high capacity and high current Power Bank is ideal for all USB devices. It's pre-charged so you can start using it straight out of the box. Carry the Power Bank wherever you go on full charge and never worry about a low battery again - simply plug it in and let it charge. Charge your smartphone, tablet or mobile device on the go with the PB-2200LED Power Bank with LED Torch. 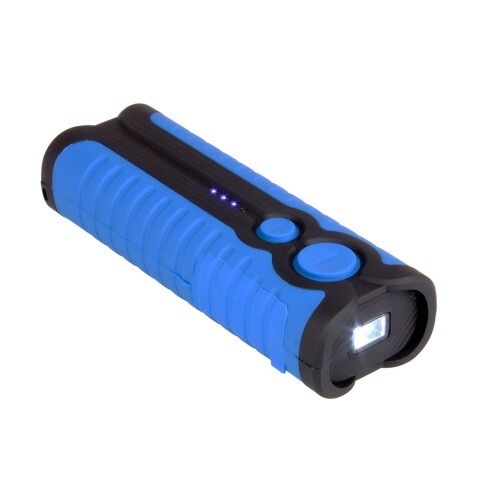 The 2200LED Power bank is rugged and can withstand bumps, drops, scraps and scratches. It is water resistant to protect against rain,and being dropped in water. It comes with a powerful LED torch to help you see in low light and at night. Perfect for camping or the outdoors.